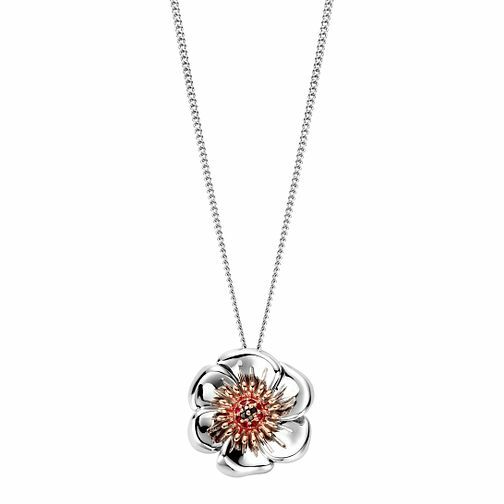 Delicately crafted in sterling silver and 9ct rose gold, this pretty pendant perfectly captures the beauty of the iconic Welsh poppy that graces the rocky gardens of Wales. All Clogau Welsh jewellery contains a touch of gold mined from the Clogau St David's gold mine - the very same gold used in generations of royal jewellery. Clogau Gold Silver & 9ct Rose Gold Welsh Poppy Pendant is rated 4.0 out of 5 by 3. Rated 5 out of 5 by Anonymous from Unique and pretty An unusual item, as always for Clogau a lovely design and good quality. Bought in H Samuel sale and excellent value for money. Rated 5 out of 5 by Anonymous from Great gift My fiancee loves this necklass, she loved it when seen online and even more in real life.